Maureen and I drive up to Asheville and Winston-Salem, where I give 3 speeches about my book. It is my first visit to these communities. Asheville is a wonderful city. Very compact downtown that is remarkably walkable. Curiously, there is a very noticeable population of "bohemians" (arts-oriented, alternative culture, green, etc.) folks who live there. Curious because Asheville is NOT a college town. Apparently, a lot of "progressive" people settle there from other parts of the country, and it is so pleasant that there are a great many tourists. Appropriately, the motto of the city is that "altitude affects attitude." This attitude, in part, leads to a population which proudly and aggressively keeps national chain stores and restaurants out of its downtown. A popular bumpersticker that exemplifies this reads "Friends don't let friends drink coffee at Starbucks." The downtown skyline is prominent, which leads me to guess that the city population is at least 250,000 people. Turns out the city population is 82,000. We notice a good number of tasty vegetarian restaurants. Impressively, their fairly new performing arts center is in the heart of downtown, which promotes downtown health and transportation choices -- in stark contrast to UF's performing arts center in Gainesville, Florida. A wonderful downtown microbrewery/pub hosts wonderful live music each night. The city is nestled within the Pisgah Forest/Blue Ridge/Smokey Mountains area. The downtown is so compact that it can easily be walked in an afternoon. A lunch we enjoy downtown is at the Salsa Café. Outstanding food. Winston-Salem was once known as the tobacco capital of the nation. We are fortunate to be set up in a historic Inn (the Augustus T. Zevely Inn) for the evening in the heart of the remarkably colonial, historic Old Towne Salem. Salem is so well preserved that I feel as if I am abruptly transported back into the 18th Century. Well preserved historic homes and shops. A fascinating Moravian cemetery ("God's Acre") dating back to the 1770s. The Moravian culture required, among other things, that graveyard headstones all consist of white stone slabs of the same size so that there is no distinction based on class or income. The Moravians also cluster deceased children in one portion of the cemetery, women in another, and men in a third location. The deceased are also arranged based on marital status. Salem was founded by the Moravians on the principle that faith should govern every aspect of life and that the interests of individuals should be secondary to the interests of the community. 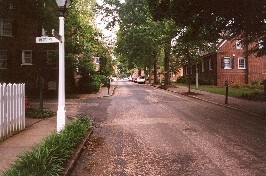 The Zeverly Inn is the only lodging in the historic district. It's restoration replicates the appearance of the building from 1844-1856. Augustus was a doctor, and his office is now used as the breakfast room in the Inn. 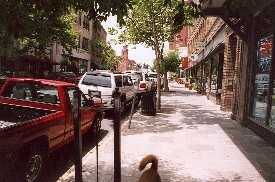 The historic district is a Registered National Historic Landmark as designated by the US Department of the Interior. 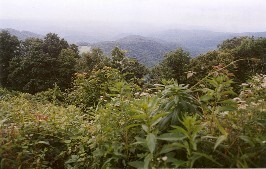 We also drive the Blue Ridge Parkway, and enjoy a few short hikes. After passing several breath-taking views along the Parkway, we are no longer able to resist getting out to experience it from a trail. We get out at Linn Cove Visitor's Center at Grandfather Mountain to hike a portion of the Tanawha Trail, which, unusually, has two separated terminations at Beacon Point. The trail is about 2 miles in length and is not at all strenuous (although we do trod up and down a number of river stone steps). The reward at the two termini is a grand, panoramic view of this mountainous, forested region. In all, the Tanawha Trail, completed in 1993, is 13.5 miles. A downside to the trail is that due to topography, the trail remains in close proximity to the Parkway, which delivers a fairly constant sound of passing cars, continuously reminding the hiker that civilization has not been left behind. The term "Tanawha" is a Cherokee word meaning "fabulous hawk or eagle". The trail contains an astonishing number of colorful, attractive rhododendrons, and the hiker often crosses small streams. Occasionally, the hiker passes by boulders the size of houses. Astonishingly, we did not see any litter AT ALL on these hikes. In all, we log about 1,500 miles of driving during our trip up to North Carolina and our drive back to Florida and home.